These are pictures of an aircraft stair and handrail system designed to make entry easier for the 87 year-old jet owner. These steps are fabricated from aluminum, are very rigid and extremely light weight, about 15 pounds, including the stainless steel handrail. They were designed to fit in the nose baggage bay of a Cessna Citation. The handrail folds for storage by removing 2 pins, and is quickly and easily deployed when the stair is put in place. The stairs and handrail mounts are all internally braced and self supporting. These are pictures of a platform, stairs, handrails, and toeboards for a soup canning line at a Pittsburgh-based vegetable, soup, and condiment manufacturer. The platform is made to be free-standing. 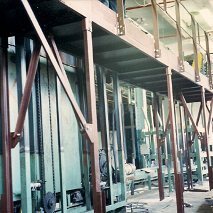 The legs feature adjustable bases that have approximately 16" of vertical travel to allow different machinery elevations to be accomodated. These are pictures of Jersey barrier tongs/clamp. It was made for a local contractor that was doing a grading job near a highway bridge. These are pictures of tow bars for aircraft. Three of these tow bars were built for a local engineering company with four aircraft . They are spring loaded closed and are opened with an over-center lever arrangement. When tow bar fork is opened, the lever/linkage goes over center to hold it open. When it is time to go on the aircraft the spring holds the fork closed. 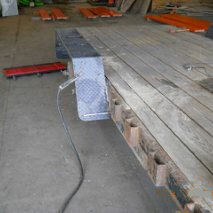 These are pictures of replacement fenders for a local gas and oil exploration company's trailer. 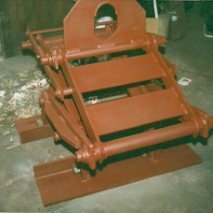 These are pictures of handrails made to the owner's specifications for a rural estate in Loretto, Pennsylvania. They are powder coated for durability, and are embedded in flagstone steps.